At the present time, most conservatories are not required to have building control approval, subject to various conditions. This policy has its pros and cons and has been subject to review by central government in recent times. The advantage is less bureaucracy, time and expense, the disadvantage is the fact that many conservatories across the country are built to a poor standard. The main issue is normally whether or not the extension will be separated from the main building by external doors. 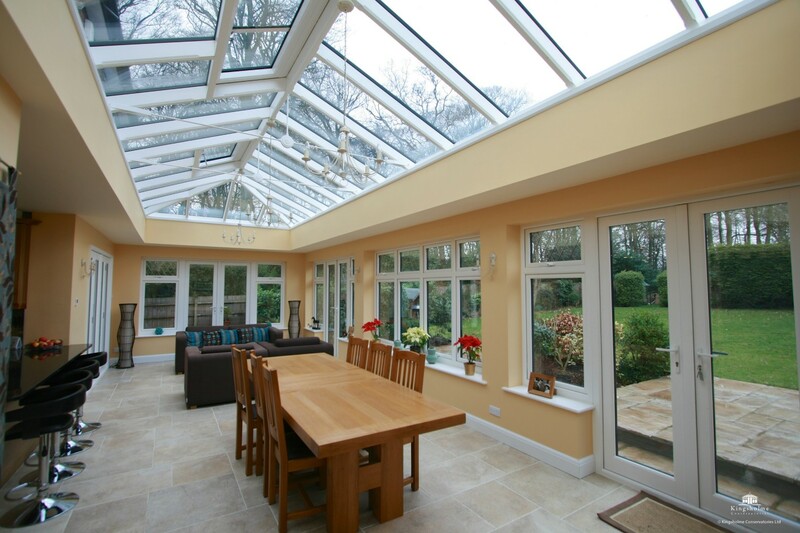 Orangeries are more likely to need building control by virtue of their lower proportion of glazing, however this actually makes much it easier to obtain approval. For some reason many conservatory companies avoid applying for building control approval like the plague! It is true that it can add a slight degree of expense and/or delay to the project, but it is normally well worth it. For pure “wow factor” nothing beats having a glazed extension fully open to the house. Over the years we have built relationships with various building inspectors in the areas we work most often. We are aware of their requirements and they know our standard of workmanship. In most cases we will take the fast track of submitting a building notice. The application still has to be backed-up with thermal and structural calculations, but this route can save precious time as building control approval is normally sought after planning permission has been obtained. The main issue in getting building control approval is meeting the insulation targets, which have been quite rightly raised in recent years due to concerns over global warming. As most conservatories have a higher ratio of glass to brickwork than the typical dwelling, we have to compensate by using glazing of a higher standard than is required in house windows. Additionally, we would normally use floor and cavity wall insulation of a higher specification. Depending on the conservatory design (more walls make life easier!) and type of house, the above measures may still not be enough. The next step is to undertake SAP (Standard Assessment Procedure) calculations, a method of determining energy use of the building overall. This may involve additional work such as increased loft insulation in the main building to offset any extra heat losses from the conservatory. The other issue that arises is foundation depth. On all our conservatories, regardless of whether building control approval is required or not, we dig to a minimum of 1000mm (one metre) for footings. The raising of modern standards means that conservatory foundations are often deeper than those on the existing house. Normally, one metre footings are fine, but it does depend on the site conditions. The main problems we encounter in the local area are the combination of high-shrinkage clay, large trees that consume a lot of water and “brownfield” sites that have all manner of things below the ground. However, if your ground is stone or chalk, or there are no large trees in the vicinity, it is unlikely to be an issue. When building control become involved, they tend to err hugely on the side of caution. As there is no separate category for conservatories, the foundations have to be suitable for a two-story building. In the past we have had to dig two metre (almost seven feet) foundations for a 600mm (two feet) wall! The other method is to use mini-piles, steel columns that are driven into the ground about eight metres deep. This method is quicker, cleaner and easier when access is difficult than digging a deep trench for footings, and tends to become more economical when a trench depth of more than 2000mm is required.